A casino in Tipperary and a new road in Kerry are part of two late, shabby back-room deals which have given the green light to a disgraceful political crime. The statement of the 26-County State’s finances for 2011 on Tuesday will see money taken from the bottom rungs of Irish society to help pay for the misdeeds of a crooked political establishment and their new international paymasters. Two notorious independent TDs -- Michael Lowry, who is currently a subject of a 13-year corruption investigation, and Jackie Healy-Rae, known in Kerry as ‘Sugar Daddy’ for his political strokes -- are set to support the agenda of the Fianna Fail/Green Party coalition. Although preparing for an election and without a working majority, the government is about to secure approval for the still unpublished Budget. It expected to be the most savage and regressive in the history of the State, and is a key element of the 85 billion bailout agreed earlier this month with the International Monetary Fund (IMF), the European Union (EU) and the European Central Bank (ECB). As a condition of the deal, the cabinet has agreed to implement several years of hair-shirt budgets. The money will help repay the tens of billions of euro which were lost by their friends in the Irish banking system, and shore up the balance sheet of the crisis-hit European Union. The first installment of the cuts will be officially announced this [Tuesday] afternoon and put to a vote later in the evening. 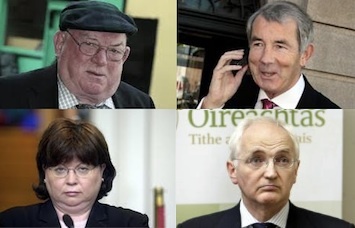 With the help of Lowry, Healy-Rae, and co-conspirator Mary Harney, the Fianna Fail/Green Party coalition now appears certain to pass its Budget -- and with it, by implication, the bailout which will cost Ireland its hard-won economic independence. As a result of the secret deals, coalition ministers are reported to have approved changes to the gambling laws as sought by Lowry, a former Fine Gael minister. He is backing a 460 million euro casino project near the village of Two-Mile-Borris in Tipperary, that received planning permission but cannot proceed due to the current legislation. Jackie Healy-Rae said on Monday that he had received a commitment for funding for the 100 million euro bypass for Tralee, the biggest road project he has yet secured for County Kerry. He said he also got a firm commitment directly from the Taoiseach, Brian Cowen, last Wednesday, for a new community hospital for Kenmare. Sinn Fein Finance Spokesperson Pearse Doherty accused both Lowry and Healy-Rae of engaging in the worst kind of self-serving parochial politics. He said the terms of both of their “irresponsible” deals must be published immediately. “Some of the consequences of this budget, if it is passed, are that more children will go to school hungry, more families will have their homes repossessed and our sick and elderly will have less chance of survival. “However, for their own political survival, both Michael Lowry and Jackie Healy-Rae feel that this is a fair price to pay. “The public have a right to know the exact details of both of these deals and they should be published immediately. “This is the type of politics that should be consigned to our history. Members of the Dail are elected to deal with national issues and should not sell out the national interest for petty parochial issues. “All TDs should take a position on the budget based on their analysis of whether it is in the best interests of the country and not on what’s best for their own individual constituencies. A demonstration is expected to gather outside the Dublin parliament tomorrow [Tuesday] evening as several protests converge on the Dail ahead of the budget. Dublin Sinn Fein is currently holding an eve-of-budget overnight vigil at Leinster House at Kildare Street this evening. They are holding the vigil in protest against the multi-party consensus for cuts, for the suspension of the Budget and for a general election. A planned Sinn Fein rally against the cuts was cancelled on Saturday, after days of heavy snowfalls, for health and safety reasons. Among those that will also be present tomorrow are the “1 per cent Network”, which is protesting against expected cuts in wages, social welfare and public sector services. The network, which includes Eirigi, the Irish Socialist Network and the Workers Solidarity Movement, derives its name from the fact that 1 per cent of the population controls more than one-third of the State’s wealth. “Right now ordinary people are being sacrificed on the altar of international capitalism. We absolutely must step up the protests against what’s being done to us,” said Gregor Kerr, the network’s spokesman. The protest march is due to begin at the Wolfe Tone statue on St Stephen’s Green at 5.30pm tomorrow and finish at the gates of Leinster House, where it is expected it will be joined by other progressive organisations, trade unions and community activists. Among them is a protest organised by the “Right to Work” campaign, which is due to march from Parnell Square at 7pm and will finish at Government Buildings. Among the groups involved are the People Before Profit Alliance, the Unite trade union, as well as members of Labour Youth. The People’s Movement group - which is opposed to a federal European Union - launched a pre-budget protest with a march from the European Commission offices on Molesworth Street to the Dail. Members of the movement work to defend Irish sovereignty. At a press conference, artist Robert Ballagh, a patron of the movement, said that “with every treaty we signed with Europe, we sacrificed an element of our national sovereignty and democracy. Director of Social Justice Ireland Fr Sean Healy said the International Monetary Fund, the European Union and the government had targeted the poor, sick and low paid while protecting the rich. Fr Healy said the distribution of the current four-year plan, which will mean 15 billion euro in cuts and additional taxes by 2014, was unjust and unfair. Some 10 billion euro will be found through cuts, while taxes will be increased by 5 billion euro over the next four budgets, beginning with Tuesday’s budget. Fr Healy said while the IMF and the government have said poor people will be protected and “everything is on the table”, they also insist senior bank bondholders cannot be asked to bear any part of the burden. “This approach is hypocritical and deeply unjust. Either everything is on the table or it is not,” he said.